Check out our TUMBLR page! Check out the Library’s visual resources Tumblr Page for images of architecture, preservation and planning from around the world. New posts every week! Looking for Images? 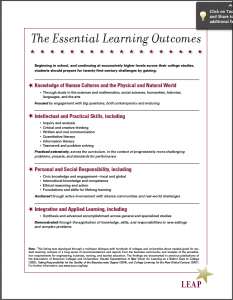 Do you need to make a presentation, or write a paper? Did you know that you can find images in Artstor, save them in a group, export them straight to a ready-made Powerpoint, and also save citations if you need to use the image in a paper? That’s a handy dandy footnote already made for you. Also, Artstor has great help documents and, Bonus: The University of Maryland Libraries subscribe to Artstor so you can set up an account with your umd.edu email address and have access to all these features. Go to Lib.umd.edu and select databases. 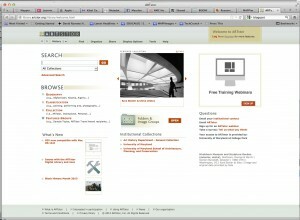 Type in Artstor in the search box. Click on Artstor. You can register with your University email address and then search for images. 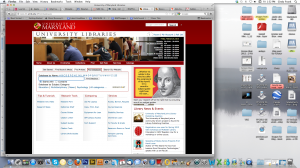 If you need a tutorial to help you get started contact Cindy in the VRC – cfrank@umd.edu. We can set up an appointment! And remember that Artstor has help documents Here. Are you looking for images? This is an interior of The Museum of Modern Art taken on March 5. Searching the archive is a little bit tedious if you are looking for specifically named buildings, but if you are looking for concepts – like the Suburbs, or traffic patterns, you will have more success. 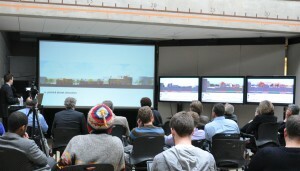 Our latest Architecture Masters Thesis presentations made use of some big-time visual technologies. Rather than print miles of color images to cover 30 linear feet of wall space, several students opted to project their presentations, using a rear projection system and a 12 foot wide screen, multiple flat panel TVs, or in most cases, a combination of both. An Architecture Thesis student presents using rear projection on a 12 foot screen as well as 3 flat panel TVs connected to a computer. As part of the ritual of graduating, these same students and their colleagues in the Urban Studies and Planning, Historic Preservation and Real Estate Development programs must put on an exhibit in our Kibel Gallery. And design the layout of said exhibit. It was suggested that the students do something ‘high-tech’ since so many presentations had used technology in the method. No problem for this crowd. They set themselves some parameters – it shouldn’t take long to set-up, and it shouldn’t cost much either. In other words, they were Done with school already. Solution? Old School slides and some slide projectors. 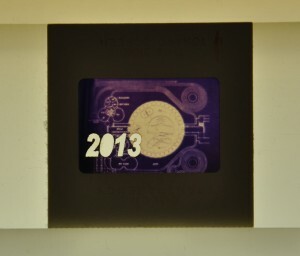 First, they laser cut the titles for graduation exhibit into the slide film. Laser cut title in a slide. Next, set up the projectors to project onto the wall surface in the gallery. The slide projectors project titles through the glass. People walking by temporarily interrupt the titles before entering the gallery. Low budget, minimal time, looks good! Stop by on a weekday, if you are in the area. 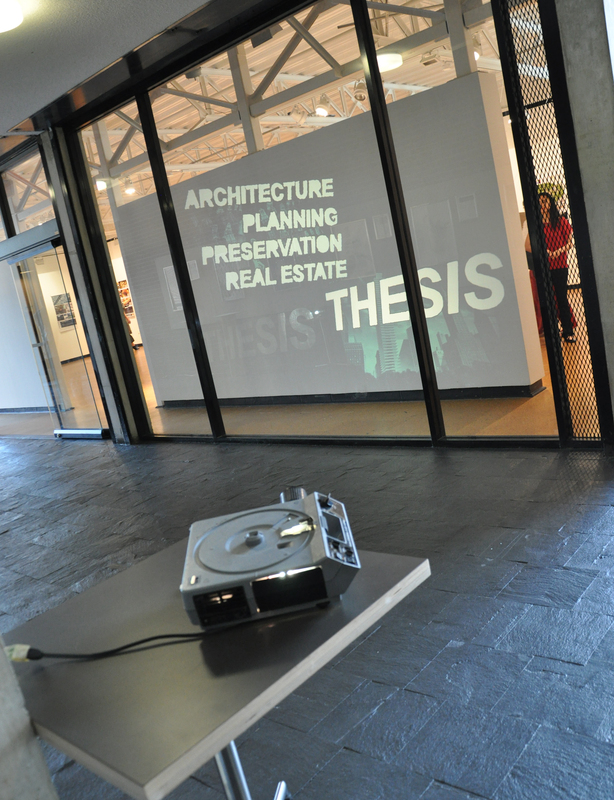 Master of Architecture student presents her thesis project. 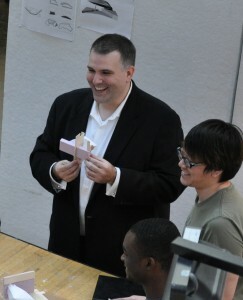 During the architecture program masters thesis presentations, the issue of taking up space to be more powerful came up. Truly, stretching out, putting your shoulders back and chin up, puts you in a more powerful pose, and the act of maintaining a powerful pose actually causes you to behave more powerfully. For anyone making a major presentation – Masters Thesis, Capstone, PhD dissertation defense, course lecture, – this is useful information. You want to be the person who is viewed as an expert on your topic. This may have personal relevance and or teaching relevance as something to share with students as they work on their presentations skills. I am including links to a Ted Talk, Wired Magazine article, and Harvard Researcher bio so that you can continue this exploration. 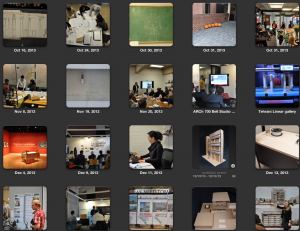 Architecture students have to make presentations several times for each design studio course. Getting up in front of your professors, invited architects and even your peers can be stressful, raising your cortisol levels. However, social psychologist Amy Cuddy has done research that shows if a person adopts a powerful pose, even for just two minutes, cortisol levels drop, testosterone levels rise and you will actually behave more powerfully, as if you really are in control, you really are the expert on your own design. Example of a powerful pose. Just to start off, stand with your feet slightly apart, arms at your sides, on your hips, or even hands clasped behind your back, shoulders back, chin up. Or raise your arms up over your head in victory. Do this for two minutes, before your presentation. When you are in front of the jury, keep your shoulders back, look at your audience, chin up, keep your hands out of your pockets, and remember, you know your building the best. You are going to give a great presentation. Have you ever tried to edit a pdf file, been frustrated by the impossibility of that, and ended up rebuilding the document in word or Indesign? How about saving a video from your phone and then trying to share it? Zamzar, a web-based file conversion tool for converting documents, music, images, and movie files, can help you out. This multi-file type conversion tool has been around for a few years and gets favorable reviews from both Wired and Lifehacker. There is a free version, a basic version for $7, or a pro account for $16. Zamzar’s free version does limit the size of the document that you can convert to 100 MB, and you then have to click on a link to get to the converted document, but it works! I tested it by uploading a PDF which I wanted to convert to a word document. After a few minutes, I received an email with a link to download the converted document. Amazingly, the formatting, including colors, was all there. PDF document that I started with. Converted document using Zamzar – a docx. Formatting stays the same. 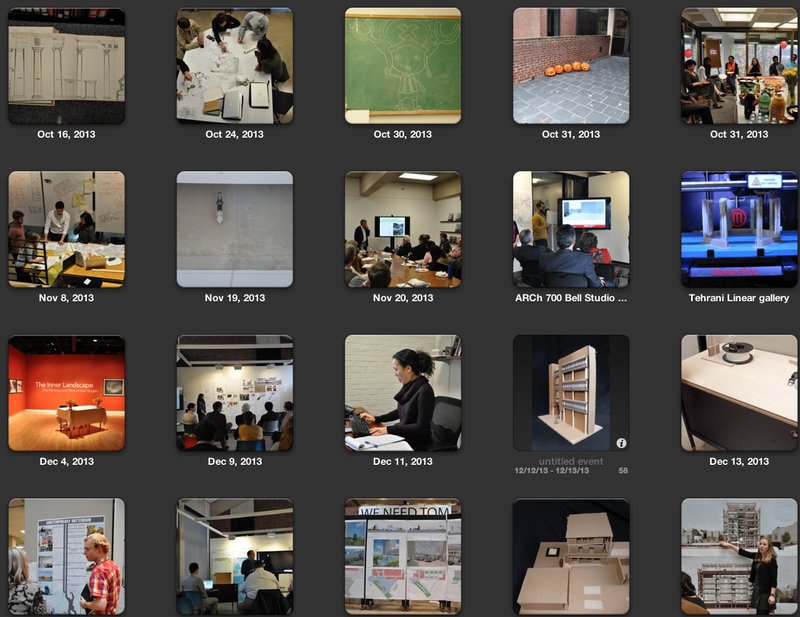 Mid–semester reviews approach next week for Arch 401 and Arch 403. Last week you all participated in an oral communications workshop. Today I would like to review and reinforce the ideas of preparing your speech. Let your drawings inform your outline. There should be an order to the drawings on the wall. Remember that your audience is our faculty, maybe some invited guests, and your classmates. Include all of them. Make eye contact as you speak, and smile once in a while. Practice what you will say, even if it is in front of a mirror. Let’s talk about Creative Commons. For those of you looking for images to illustrate points in a paper, or populate a Powerpoint or Prezi or PDF, the internet has a wealth of images. However, there are copyright restrictions placed on many images, and for a person doing research for scholarly publication this can be very confusing. Creative Commons has licenses that allow copyright holders to make their work available to others, on conditions of the creator’s choice. So, if you are creating work, you can use one of several Creative Commons licenses, and if you are looking for images, music, blog posts that you can use in your own work, you want to look for items with a Creative Commons license. This page explains the licenses. An example of a creative commons type license you would find on an image. This page allows you to search various giant databases that have Creative Commons licensed work. 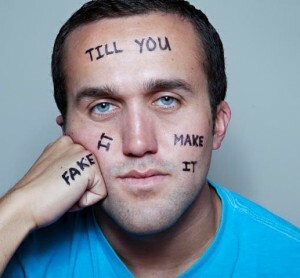 Pay attention to the copyright notice attached to any image or work you find on the internet. Often people are ok with noncommercial use, as long as you attribute the creator. Remember to treat others and their intellectual property as you wish to be treated. Also, any of these licenses may be negotiated if you contact the creator of the work. 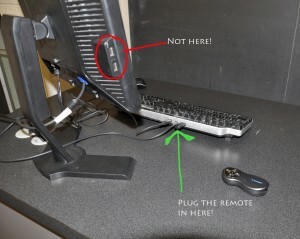 Where to plug the powerpoint remote receiver. 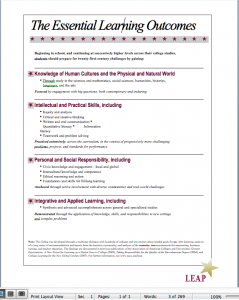 Are you teaching in a tech classroom? Frustrated by the powerpoint remote not working? To check if the batteries (2 AAA’s) are the problem, pull the little receiver out of the hand held device and press the laser button on top of the remote. If the light comes on, then the batteries are fine. If the light does not come on, the batteries are dead and need to be replaced. Is the red light laser pointer working but your slides are just not advancing? the batteries are fine, but you may have it plugged into a port that is not working with the receiver. Try one of the USB ports that is on the front of the computer, or the USB port that is on the back of the keyboard. See the picture above. Do Not plug the remote receiver into the monitor. See the picture above.